Product #699 | SKU IM2370-00001 | 5.0 (based on 1 rating) Thanks for your rating! 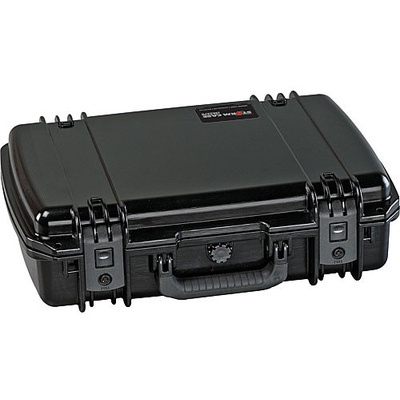 The Pelican iM2370 Storm Case with Foam (Black) is an injection-moulded case made of HPX high performance resin, that is virtually unbreakable, dent-resistant and shatter-resistant. It is tough, rugged, lightweight, airtight and watertight. There is a permanently attached Vortex valve that automatically adjusts air pressure without letting in water, and won't unscrew from the case. Press & Pull latches open with the push of a button, yet stay closed securely under impact or stress. The case has unbreakable moulded-in hasps that allow the addition of standard size padlocks. It has hinges with integrated feet that hold fast under impact, and create a flat surface for upright stability. It is carried by a double-layered, soft-grip, solid-core handle that provides strong, durable comfort. I have has this case for about a year now and can't say enough about how great it has been. Used for the laptop and transport of fragile goods as required. Just here to grab another inner foam so thought I would say a word about it. Cheers guys. Regards Paul, New Zealand..